The following book review was written by a member of Bookmarked, the high school book group at PFTSTA. 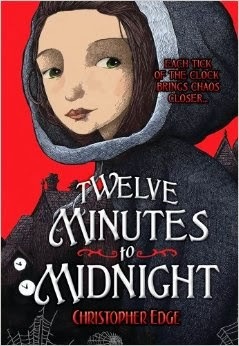 This book is geared to 8-12 year olds, but as you can see the reviewer Michaela, who is 14, is a big fan of the story. The blood-curdling tales in the magazine, The Penny Dreadful, are taking London by storm. No one expects the author to be thirteen year old Penelope Tredwell, who writes under the pen name of Montgomery Flinch. She seems to have the city in the palm of her hand. One day, she gets a letter from the Bedlam psychiatric hospital asking for Montgomery Flinch's help in a mysterious case. Each night, at exactly twelve minutes to midnight, the patients rise from their beds in a trance like state. They maniacally write continuous ramblings of gibberish. However, Penelope soon discovers that these writings are much more than gibberish. They are predictions of the future. She becomes determined to solve this eerie case, but realizes that this power is much more dangerous than she thought. This twisted evil will stop at nothing until the entire country is tortured with its sick visions of the future.